Karpenko Physico-Mechanical Institute of the National Academy of Sciences of Ukraine. Design Bureau «Pivdenne», Dnypropetrovsk, Ukraine. Domains of effective application and peculiarities of ultrasonic computerized tomography in nondestructive testing and material technical diagnostics have been analyzed. The ultrasonic computerized tomography technologies, developed facilities and experimental results on tomographic reconstruction of the material defects and physico-mechanical characteristics spatial distribution in products volume have been represented. It is shown that proposed tomographic methods and facilities allow to estimate not only the material defective state in the products with the ingomogeneous internal structure, but also to estimate the material predefective state on the basis of information about the material physico-mechanical characteristics spatial distribution. At present time a tendency of wide application of the computerized tomography (CT) methods, as functionally the most perfective and informative methods, is being observed in evolution of the diagnostic systems. But in ultrasonic (US) nondestructive testing (NDT) this tendency is expressed more weakly. Expedience and topicality of use of the tomographic reconstruction methods for obtaining of images of the material properties spatial distribution (SD) in products volume for increase of the technical diagnostics (TD) level and authenticity may be demonstrated on example of the welded sheet product. On the figure 1 the schematic presentation of some probable defects types and material inhomogeneities in the welded product (a) and the reconstructed experimental acoustic image of the defects and one of the material mechanical characteristics (Young's modulus) SD in the real welded sheet product (b) has been represented. The presented image confirms that processes of material defects formation and inhomogeneous distribution of the material physico-mechanical characteristics (PMC) formation are mutually connected. The formed defects results in the material PMC SD of different nature, but intensive development of the PMC inhomogeneous distribution (for example, the material deflected mode (DM)) results in defects origination and development. defects presence is being characterized by the acoustic parameters jump on its borders. Fig 1: The schematic presentation of some probable defects types and material inhomogeneities in the welded product(a) and the reconstructed combined ortographic image of the spatial distribution of defects and Young's modulus (b) in the welded plate. Describing the material PDS, pay attention to absence of sharp changes of the material acoustic parameters and presence of the anomalous areas which are being characterized by small (weak-contrast) material PMC changes and described by monotonic functions of the spatial coordinates. Developing of the USCT technologies and systems, it is necessary to take into account. these peculiarities. The main idea of this scientific work consists in the following. The traditional TD methods are being based on use of information only about the product defectivity and material PMC, averaged on product volume, surface or some direction. But, really (see figure 1,b) the material PMC SD is inhomogeneous. Besides, the traditional NDT and TD methods are aimed only on estimation of the product working life after a defect was formed and detected. But, methods of estimation of the material PDS on the basis of NDT information practically are not developed. In authors opinion, just information about the inhomogeneous SD of the material PMC in product volume, including information about the inhomogeneous material DM, opens new possibilities of materials TD, including estimation of the material PDS. In the given work the USCT methods have been proposed to use for achievement of these aims. The main peculiarities of CT application in US NDT consist in variety of the data collection methods and schemes, which are being determined by products form, and presence of the different physical phenomena, which accompanish of the waves spreading in the product material and their interaction with the material ingomogeneities. That causes numerous USCT methods and algorithms. But at the present time, the fixed classification of the tomographic methods in US NDT is absent. The USCT methods are being classified on the measuring acoustical characteristics (US waves spread velocities, attenuation, etc. ), physical phenomena at US wave spreading, such as reflection, refraction, diffraction, scattering. But such classification does not reflect the characteristic features of the tomographic method. Fig 2: Classification of the computerized tomography methods in ultrasonic nondestructive testing. One of the possible approach to classification is division of the CT methods on their application, that determines requirements for USCT method and it's main peculiarities: a type of the reconstructing SD, a sort of projecting data, physical phenomena which are being taken into account at description of US waves spread, and the material characteristic, the SD of which are being determined. The corresponding classification table is presented on the fig. 2. The USCT NDT methods may be divided on two great groups on the character of the reconstructing SD. There are methods of material defectivity estimation and PMC SD determination. In the first case, a task are being result in reconstruction of the spatial function, which discribes the volume distribution of the material local inhomogeneities in a product, and in the second case the restoring function is weak contrast and slow changing in the spatial coordinates. Consideration of apriory information about the restoring function type essentially influences on approaches to the tomographic reconstruction procedures. Then, in the paper, main principles of the USCT NDT methods and facilities development for both cases will be considered. In the US TD problem not all tasks require of application of such high technological, but expensive, methods as the CT methods. Detecting and recognition of the weak contrast defects in the products with the strong inhomogeneous internal material structure is very important NDT task. Such defects are being happened both in metallic products, especially in welds, and in composite materials with high level of US waves attenuation and structural hingrances. This task are being badly resolved by the traditional US NDT methods, but he USCT methods in the shadow variant are sufficient effective for this aim. tomographic reconstruction of the defective zones acoustic images, in order to get the defects characteristics, sufficient for product diagnostics. where f*l(k) - measured projecting data between the transducers pair l in the product section k; - mean and root-mean-square deviatation of f*l(k) in different product sections for the l-th pair of transducers. The value f*l(k) is the value fl(k) of integral along the US wave spread way from a function, which discribes the material acoustic characteristics (AC) SD in the section k. Introducing of projecting data pl (k) provides establishment for each transducers pair of an individual threshold, adaptive to hindrances level. The value a determines the probability of value f*l(k) exit at the established threshold. The restored, on the basis of new projecting data, function represents the inhomogeneities (defects) SD in section k concerning of the formed «statistical standard» of the «nondestructive» section. At high level of hindrances and concerning small quantity of projecting data the AFP method allows to reconstruct the more qualitative tomographic images of the defects SD than traditional methods with use of 2D Fourier transformation. The mentioned above NDT methodology and AFP method was realized in the US tomograph (UST) for testing of the toroidal product from carbon-carbonaceous CM with multilayer stranded glued structure and detecting of such defects as cracks, material different density, porosity, etc., at random defects orientation (figure 3), that was practically impossible by the standard US methods. 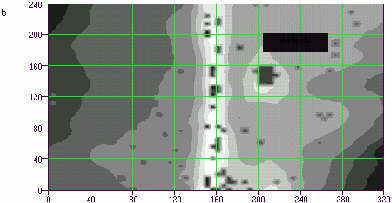 Fig 3: The ultrasonic computerized tomograph for NDT of the toroidal product from carbon-carbonaceous composite material and the experimental tomographic acoustic image of defects (porosity) spatial distribution in the product section, reconstructed by the AFP method. A problem of estimation of the material PDS is connected with such physical processes as material degradation and defects origination, which, accordingly, are being characterized by formation of the inhomogeneous SD of the material PMC. Therefore, the material PDS estimation problem is being reduced to the material PMC SD determination problem. In this material state the spatial changes of the material AC (and, accordingly, PMC) are very slow and weak contrast (a few or parts of a persent). The USCT methods are the most useful for evaluation of the PMC SD in the product volume. However, a high accuracy of the material AC measuring is needed. Besides, at description of the US waves spreading one can admit a beam approximation, which allows to use the transmitting CT approaches for determination of the material AC SD and calcullation on its basis of the scalar and tensor (stress field) PMC SD. NDT systems, based on the US CT methods, should provide high sensibility and productivity, maximum of universality. Peculiarities of the material US sounding don't allow to use directly high productive technologies of x-ray tomography at data collection by parallel projections. reconstruction of material inhomogeneities in anomalous areas. tomographic method of the scalar and tensor characteristics division. - beam projection. High productivity of calculations at tomograghic reconstruction on the basis of beam projections is being provided by the inverse projecting (IP)method. As a result of IP we obtain the SI , which is a low frequency copy of the true SD and is connected with one by resultant. Taking into account a property of the low frequency of the reconstructing AC SD, the SI may be as a sought image for detecting and localizing of the products anomalous areas. In the case when the SI is not sufficient for TD, the problem of reconstruction of the true SD on the basis of the SI is being arised. Traditional approaches on the basis of Fourier transformation or resultant application need large calculations and are not suitable for practical applications. Let note two stages of proposed IT. The first stage - that is the construction of SI on the basis of beam projections . The second stage - that is the construction of the true SD on the basis of the reconstructed SI. The second stage is being fulfilled only at the presence of the anomalous areas. In this case the parallel projections are found, using the SI. After obtaining of parallel projections a double differentiation of these projections on argument s are being fulfilled. In result we obtain the parallel projections and further the SI on the basis of these parallel projections is being constructed. The SI is the true inhomogeneity SD, i.e. . Similar algorithm provides more stability to disturbances action at reconstruction of the weak contrast SD. In some practical situations the product geometric peculiarities limit the possibility of projection data collection. In sheet products the limited viewing angle deteriorates reconstruction quality along the sheet thickness. For this situations the algorithm of reconstruction of the OI, which is the projections of the PMC SD on the surface of the sheet product, have been proposed that allowed to reduce the NDT task to 2D-tomography task at 3D-collection of projecting data. The typical data collection (US sounding) scheme by use of a mirror-shadow method at US testing of a sheet product have been presented on the figure 1,a. Such schemes and the mentioned above IT had been used at development of the UST for material characterization (laboratory model UST-2000) (figure 4). 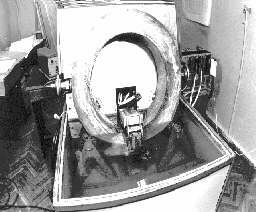 Fig 4: The ultrasonic computerized tomograph for material characterization UST-2000 (laboratory model). This tomograph is intended for determination of the material AC SD of the material AC such as spread velocities and attenuation of the longitudinal, transverse and surface US waves, and for determination on this basis in thick-walled sheet products of the of the material mechanical properties SD: elastic (elasticity modulus), strength (strength modulus), technological (hardness), structural (grain size, intercrystaline corrosion) characteristics and parameters of the material deflected mode (stresses tenzor, tenzor invariants). Also, the UST may be used for reconstruction of the weak contrast defects SD in product volume and determination of it`s form, size and orientation. For illustration of US NDT tomography possibilities on the figure5 the experimental reconstructed tomographic images of the material PMC SD in steel sheet specimen by thickness 28 mm with V-similar weld have been represented. Fig 5: Reconstructed tomographic images of the spatial distribution of grain size D (mm) (a) and ultimate resistance sv(MPa) (b) in the vertical sections of the welded plate across the V-similar weld. The modern requirements to technical diagnostics require of new products NDT technologies. The ultrasonic computerized tomography present wide possibilities in this direction. The proposed classification of the USCT NDT methods allows to select the necessary USCT method for concrete NDT application. In the US defectoscopy domain the USCT methods are the most effective for detecting of the weak contrast defects in the structural inhomogeneous materials. New diagnostic possibilities the US CT methods open in the material characterization domain, providing information about the material physico-mechanical characteristics spatial distribution in the product volume. The developed USCT main priciples, methodology, methods, information technologies, facilities and the experimental results on reconstruction of the tomographic acoustic images of the spatial distributions of the weak contrast defects in composite materials and material physico-mechanical characteristics in the welded products, represented in the given paper, confirm the USCT NDT methods effectivity. The present research work was carried out in the Karpenko Physico-Mechanical Institute of the National Academy of Sciences of Ukraine and Design Bureau «Pivdenne» of the National Space Agency of Ukraine within the frame of Project #612 of the Science and Technology Center of Ukraine. Z.T. Nazarchuk, V.V. Koshovyy, E.V. Krivin, I.M. Romanyshyn. Ultrasonic Tomography Technologies for NDT and Monitoring of Material Degradation // Proc. 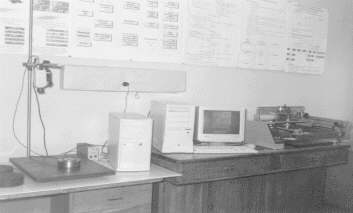 of the Joint EC-IAEA Specialists Meeting, 10-12 March 1999, Petten, Netherlands / Edit. U. von Estorff, L.M.Davies, P.Trampus, Luxemburg, 1999, 252p.- P.79-89. V.V. Koshovyy, D.E. Krivin, E.V. Krivin, I.M. Romanyshyn. Tomography of sheet products // Defectoscopija.-1998, 9. - P. 20-27 (in Russian).